About 200 people gathered in Istanbul to honour the memory of murdered Saudi journalist Jamal Khashoggi, demanding justice over the killing. 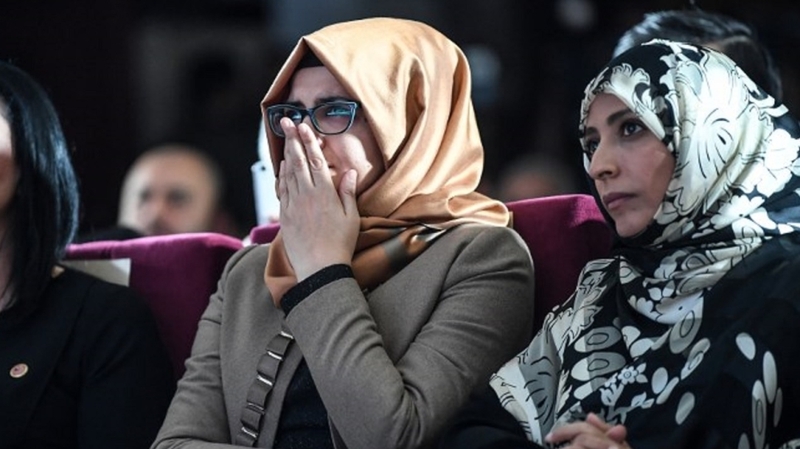 Supporters met on Sunday to talk and watch videos of eulogies for the Washington Post contributor, who was killed on October 2 inside Istanbul’s Saudi consulate, where he went to handle paperwork for his upcoming marriage. His fiancee was among the participants of the memorial. Yemeni human rights activist Tawakkol Karman, who won the 2011 Nobel Peace Prize for her participation in the Arab Spring uprisings, said the killing was reminiscent of crimes committed by the Islamic State of Iraq and the Levant (ISIL, also known as ISIS) group. After insisting for more than two weeks that Khashoggi had left the consulate, it then admitted the journalist had died in a fistfight inside the building. Later, Riyadh conceded Khashoggi was killed in a premeditated murder, but that the murder was an unplanned “rogue operation”. However, Turkish President Recep Tayyip Erdogan has accused the “highest levels” of the Saudi government of ordering the hit, while some officials have pointed the finger at the crown prince – a charge Riyadh denies. Erdogan said on Saturday that Turkey shared recordings related to the killing of Khashoggi with Saudi Arabia, the United States, Germany, France and Britain. The Turkish leader discussed the issue with US President Donald Trump during a dinner marking the end of the first world war in Paris, according to White House officials. Sources told Al Jazeera on Saturday that Turkish police ended the search for Khashoggi’s body, but that the criminal investigation into the 59-year-old’s murder would continue. Al Jazeera also learned through sources that traces of acid were found at the Saudi consul-general’s residence in Istanbul, where the body was believed to be disposed of with the use of chemicals. The residence is at walking distance from the Saudi consulate.